Great 5 Year Old Birthday Party Idea: A Pinkalicious Party! 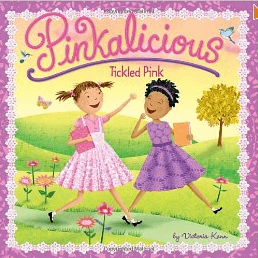 “Pinkalicious” is a fantastic children's book by Victoria and Elizabeth Kann. 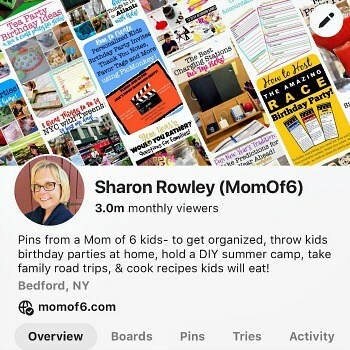 It tells the story of a little girl who can't stop eating her Mom's pink cupcakes…. and she eats so many that she turns pink! My youngest daughter loves this book, and so we themed her 5th birthday party around it. And since her's is a summer birthday, we held it outside on a lovely sunny day. I created my own party invitation in Microsoft Word that fit our theme, and asked all of the guest to please park in the street so that we would have our driveway available for our party games. When the guests arrived, we set up a funny croquet game in the yard… after the girls hit the balls through the hoop, they had to follow the instructions on the top of the hoop- such as jump up and down 5 times while singing Happy Birthday or spin in a circle 5 times fast! After all of the guests had a chance to play the funny croquet game, we made our party craft- bottle cap necklaces that featured the Pinkalicious character. 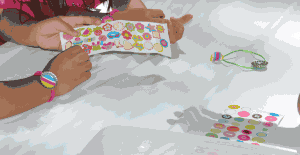 The girls glued in the paper cut out and then placed a plastic “bubble” on top to protect the paper. They strung the bottle cap onto the necklace cord of their choice. Then they made a bottle cap bracelet, using stickers of their choosing. 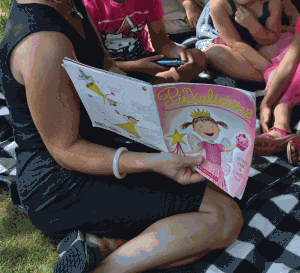 After the craft, we all sat down on a picnic blanket, and I read the story of “Pinkalicious”…. Next we played a “pass the crown” game that works kind of like hot potato…… you pass the crown from person to person while the princess music plays, and when the music stops the person left holding the crown is eliminated from the game. The last game we played was a hunt for a Pinkalcious puzzle that I had made using a puzzle making system that I found from Heartsong. The girls first had to sit on a balloon to pop it, and inside of the balloon was a piece of colored paper….. they then had to look in a certain area of the yard for a bag of puzzle pieces that also had that same color on it. When they found their puzzle bag, they could bring it back to the table to assemble it. 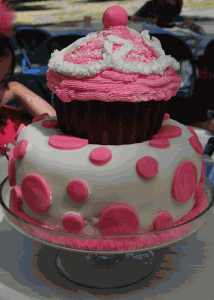 I baked and decorated this cake, modeled after the pink cupcakes that Pinkalicious adores in the book! 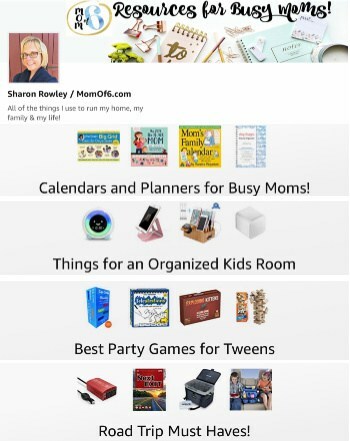 The favor bag itself was simple… just a copy of the latest Pinkalicious book for each guest. 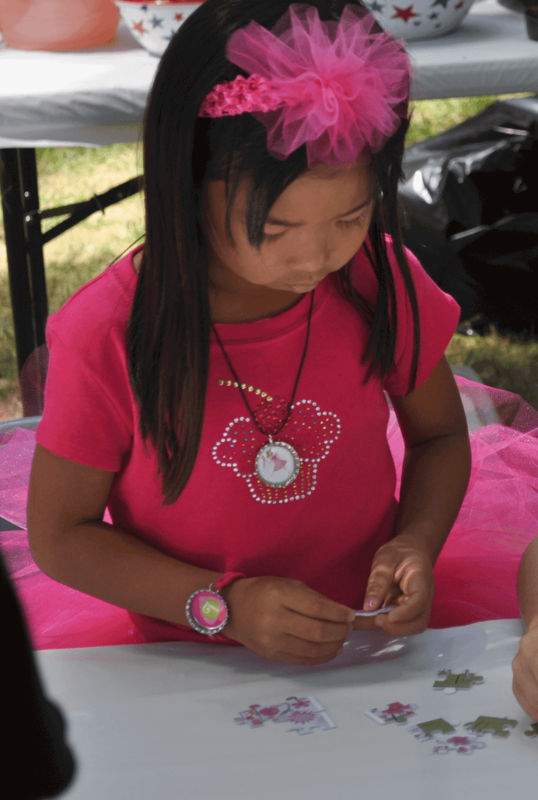 The girls also went home with their Pinkalicious bottle cap necklace and bracelets as well as their party puzzle. 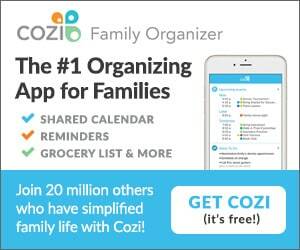 I hope that this party idea made you feel inspired! 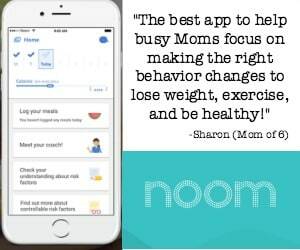 If you like this post and would like to see more from Momof6, please “Like” our Momof6 Facebook page! 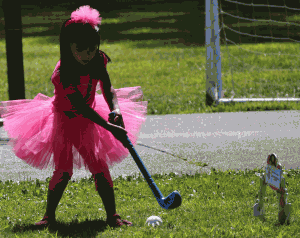 « Great 4 Year Old Girl Birthday Party Idea: A Minnie Mouse Party! 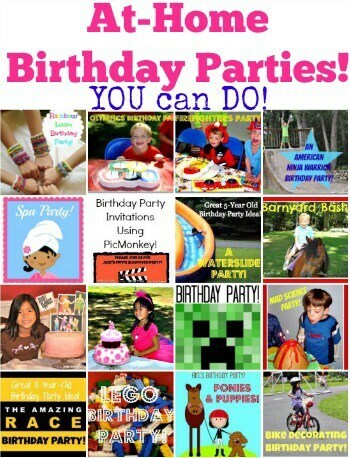 I am so glad that you are enjoying the kids party ideas- and of course you can use any or all of the ideas for your parties… that’s why I am sharing them here! Would love to hear how it turns out!